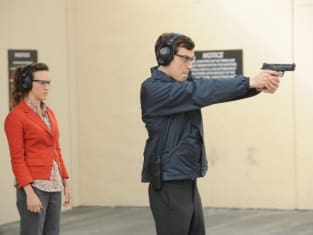 There's just no other way to say it: The opening body discovery from tonight's episode of Bones was one of the grossest in recent memory. I can't get the image of the face plastered on a guy's shirt out of my head. And I can't decide if the fact that I can't see anything else is good or bad, either. Perhaps the gross-out factor was meant to cover for the fact that this episode was just a filler until the show returns in November. That's right. As far as episodes of Bones go, "The Tiger in the Tale" wasn't the show's finest hour. Perhaps the best thing to come out of the episode is that Daisy and Sweets broke up. That storyline was the best of the competing three. The pair decided to move in together, but Sweets has underestimated the significance of such a maneuver. Where he sees someone to split the bills, she sees the beginning of the rest of their life together. After talking with Cam, Angela, and Booth, Sweets knows what must be done. Instead of carrying her across the threshold, he hands her the keys and tells her it's over. The break up was strange, yes, in that aside from his brush with Agent Sparling last week there was nothing to indicate trouble in Camelot. But I can't say I'm sad to see Daisy go. Her voice grates. Her enthusiasm prickles. Her bird-like features are, well, bird-like. If you guys don't like Sweets, and judging by your comments on last week's review some of you don't, I really don't like Daisy. Let's see Sweets mope for a week and question his decision and then move on to someone else without ever having to hear from Ms. Wick again. Or we could just get back to focusing on Booth and Bones. I like this somewhat playful, dare-I-say-it happy Booth and Bones we've got right now. They are the epitome of the complementary couple and seeing their relationship play out in both the home and work settings is enjoyable. But it's wearing thin as the basis for the series. The Bones-for-President bit was lame. 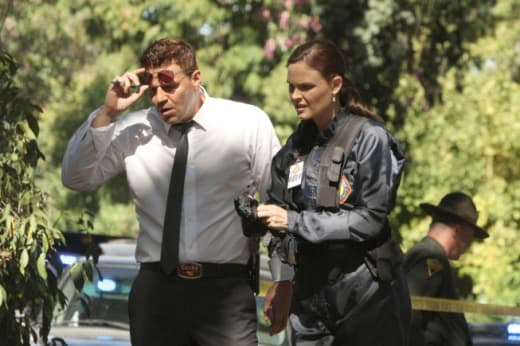 It's as if there's nothing to do with Booth and Bones without drama to rattle so the writers throw together some farcical plot where Bones, out of thin air, begins to contemplate what kind of leader she'd be. Where was the set-up for that? Nonexistent. And where is this going? Nowhere. Would someone like Temperance Brennan make a good President? Maybe. Maybe not. Does it really matter? No, it definitely doesn't. The entire thing was a waste of screen time. Hodgins, Angela, and Cam were all relegated to the background tonight, existing solely to joke about excrement, cause damage to Jeffersonian equipment and help Sweets with his existential crisis. That was a waste, too. They're capable of so much more. I'm not overly impressed with Bones Season 8. Aside from the first episode, we've gotten very little substance so far. I'm hopeful that when the show returns in November we'll get back to the case of Pellant, or another similar multi-episode arc that features drama and a problem that seems almost too complex to be solved. What did you think of "The Tiger in the Tale?" Is season 8 standing up to previous seasons, or do you think it could be better? Let me know what you thought in the comments. And if you need a fill while we wait for Bones to return, check out the Bones quotes page. Rate them and submit your own.